A friend of mine, Maria, who has recently become interested in photography asked if I would accompany her on a sunrise shoot. As it had been much too long since I had photographed a sunrise, I eagerly agreed. Of course, when when I awoke to my alarm clock well before sunrise on an otherwise lazy Saturday, I was considerably less eager to set off for the sunrise shoot. But, I was ready when Maria picked me up about 45 minutes before sunrise. I had advised Maria to use The Photographer's Ephemeris to scout out possible locations she'd like to use for the sunrise shoot. We are fortunate to live in an area of the country that provides vast views of the sky with interesting, varied landscape options (the Atlantic Ocean, marshes, rivers, fields with oak trees, etc.) with only a short drive required to arrive at any of them. Unfortunately, time had gotten away from Maria; she had not researched any options before arriving at my door. So, we drive a short while before coming to a small town, Thunderbolt, about 5 miles southeast from downtown Savannah along the Wilmington River. After seeing a nice looking dock on the right side of the road (before the upcoming overpass), I suggested we stop to photograph it before the sunrise. 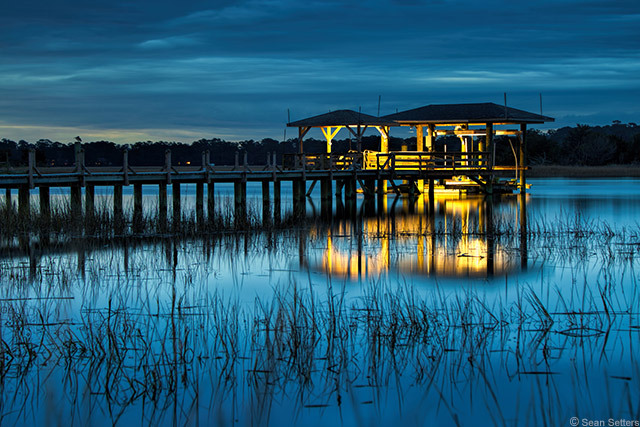 As we were walking the short distance to a clearing with a good vantage point, I noticed how striking the glow of the covered dock looked against the rich blue of the sky. "Blue hour," as it's commonly referred to, is the time just before sunrise and just after sunset. This time presents especially good opportunities to photograph landscapes, seascapes and cityscapes (as well as many other subjects) set against the deep blue color and hint of warm sunlight that often graces the sky just before sunrise. Sunrise came not long after this shot was taken, but clouds obstructed its view making us very glad to already have our blue hour photos in the bag. My advice? Take some time this week to shoot a sunrise. Even if the circumstances prove to be less than ideal from a photography perspective, the experience may prove fulfilling from a personal one. There's just something refreshing about a sunrise. The shot above was created using a 7-shot exposure bracket, edited in Aurora HDR 2019 and Photoshop CC.